I always thought French was such a beautiful language…until I got in a wrestling match with it. Some people have a knack for languages. That group would not include me. In addition to English, I struggled through four years of Spanish in school. Although I’m not great at it, if I find myself in a foreign country, any foreign country, I for some reason reflexively revert to random Spanish. I once greeted (Hola!”) and tried to give instructions in Spanish to a cab driver in Japan. My brain evidently divides the world into English-speaking and Everything Else. My husband was no help – he took German in school. 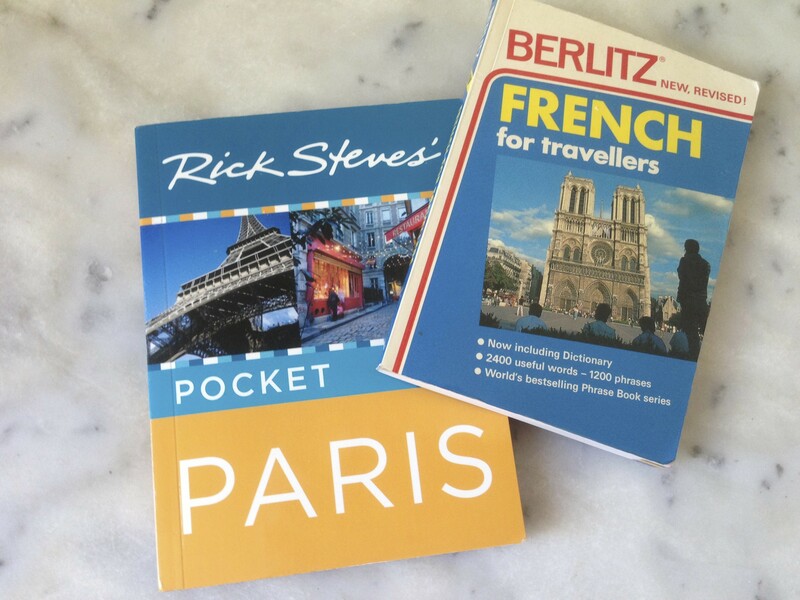 In anticipation of our trip to Paris, we had every intention of learning some French. I looked into potentially taking a community college course but couldn’t find one that fit my schedule. Then I downloaded a French app on my iPhone that proved to be useless (“the cat is black”) and with which I developed a weird love-hate relationship. (A bell would ring when a correct answer was given and an obnoxious gong would sound when I messed up.) We still have the “Quick and Easy” French language CDs that someone lent us sitting, un-cracked, on the kitchen counter. And, I got busy with other preparations. Everyone assured us, however, that “Parisians all speak English” and “you only need to know a few key phrases.” I listened to Rick Steves podcasts which I interpreted as saying that as long as you start any communication with pleasantries such as “Bonjour Madame,” (to create some goodwill) you would then be forgiven for either not speaking or butchering the language. So off we headed to France, having memorized about 3 key phrases, most of which we already knew from movies and It’s a Small World. Just to be safe, I downloaded iTranslate on my iPhone, and a friend lent me a little Berlitz “French for Travelers” book. On the flight over, I pulled out the Berlitz and glanced over the special rules of French. For example, a “G” is pronounced “J” or “Z,” the last consonant in a syllable is usually silent or picked up at the beginning of the next, and an “R” is a weird throat sound. I was starting to get nervous. The phrases were listed phonetically and I noticed that they were pronounced much differently than they were spelled. The French seem to disregard whole chunks of letters in a word and add or mispronounce others. I spent much of the flight repeating over and over to myself “pahrlay voo ahnggleh” (do you speak English?) and “zher ner pahrlpah frahngsseh” (I don’t speak French.). How stupid was that – learning how to say you can’t speak a language…in that language?! Our language troubles in France began almost immediately. When we arrived at our apartment, a young fellow named Leandro met us. He spoke no English. He gave us the keys and explained everything we needed to know in French…. and pantomime. When it came time to agree on a time for check-out, we pulled out our iPhones and negotiated via iTranslate, When he left I wasn’t completely sure how anything worked or what I had just agreed to. Then we walked to the Metro station to buy either a weekly pass or a carnet (I wasn’t sure which was best or how to buy). We found the Information Desk, as Rick Steves advised to get help, and I did my best “Bonjour Madame, pahrlay voo ahnggleh” and she looked at me, unimpressed, and said (in perfect English I might add) “No”. The next trial was finding supplies at the market. Everything was in French! (And why did that surprise me?) I found a friendly young Parisian who admitted to speaking a “little” English but “soy milk” wasn’t in her vocabulary. By the end of the first day, we were mentally exhausted. Over the course of our visit, I found the language barrier more problematic than anticipated. English was not as widely spoken as I had expected. I was embarrassed that I hadn’t learned more French and that I probably epitomized the stereotypical ignorant American who expects everyone to speak English. When I did attempt French, I’m sure I bungled it horribly. The French word for “where” is pronounced “oo-ay” so when I asked for directions I’d try to say “oo-ay toilet or oo-ay metro.” One entire day, I got puzzled looks with my requests for directions—- since I couldn’t remember, I was alternating between “ee-ay” or “i-ay” or “oy-vay”. When a proper response to a question was “oui” I often said “si” (back to my random Spanish). My husband, despite my frequent coaching, never quite mastered the “Bonjour Madame” lead-in, and charged into every conversation in English without any pleasantries either in French or English. We became accustomed to that Look of Disdain that Parisians do so well. While on a train to Normandy, it came to a halt, an announcement was made in French only, and many people got off. Some time later, another announcement in French, and everyone got back on. We still have no idea what happened. At that point, I mentioned to my husband that not speaking or understanding the language gave me the sense of being deaf and dumb. But more importantly, not speaking the language impeded our ability to connect with the locals. One thing I enjoy about traveling is meeting people in the places we visit. Since we stayed in an apartment rather than a hotel, locals rather than English-speaking support staff and fellow guests surrounded us. I shared my frustration with an Australian woman we met in Normandy and she told me she had taken French lessons but it didn’t help that much. So, I’m not sure I could’ve learned enough French to have the level of engagement I enjoy, but I think next time I visit a non-English speaking country I would like to make more of an effort to learn the language. At least so I could say “I speak a little of your language” in their language.